Over time with the help and guidance of a Swami (monk) Tina began to be aware of changes not only to her body but more importantly her mind and how she was choosing to live her life in a much more positive and loving way. 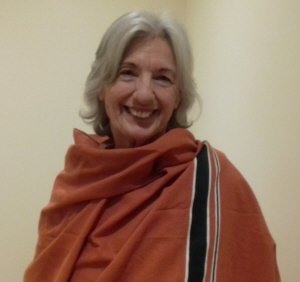 Then, with a serious illness she decided to take a yoga teachers training course with no intention to teach, but to develop her spiritual strengths, and whilst training realised to teach yoga was her destiny. Her passion for the power of the practice continues to grow and she is totally committed to passing these ancient teachings on, in a very practical and down to earth way. Please note: for all overseas holidays Tina prefers that her yoga students have some experience of yoga. If you are new to yoga and have very little experience please check with the Free Spirit office that the holiday is suitable for you. Private Weeks: If your chosen holiday is marked 'private week' then those students who go to Tina's yoga classes, or have been on yoga holidays with her before, will get priority. If this does not apply to you and you wish to join the holiday then please talk to the Free Spirit staff who will find out if it is possible to include you. Joy and Gratitude will be the focus of this weekend. With our busy lives its so easy to bypass these two beautiful aspects of what it means to be human, the great Masters from all traditions remind us that this is what our yoga practice is really about. During this weekend we will have the time and space to reflect why we came to yoga and why we stayed, what we could improve on and what we could let go of. On Sat and Sun morning Tina will be available to give personal instruction and answer questions outside of the group yoga classes. This weekend will be for everyone. Complete beginners please call Free Spirit for guidance.